Prize #1: Metal Ichthus Wall Decor - goes to .... "grannyval"
WooHoo - our big winner! Please contact me (see upper right for my email) and I'll get your prizes to you!!! 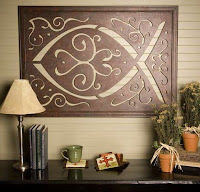 PS: Don't forget you can still purchase the Ichthus wall piece for only $99 + free shipping thru 3/1/09 - with discount code JWBLOG at checkout. I didn't win but am glad Granny got the grand prize! Go Granny! Congrats to all of the winners! When I saw Susan in SC, I did a double take! Enjoy this day! And now I have the word "ichthus" stuck in my head. Congrats to all of the winners! You are a very generous lady! What wonderful prizes here. I will just wait my turn until next time, or the next time I hit our Hallmark! Congrats to my bestie, Natalie! From a greatful greatful granny.Congrats to all other winners and to the others don't give up. I looked today and what a surprise,you see today is my birthday ! God knows what we need even before we do.He is so faithful. God Bless each and everyone of you. Jeanne could't find your e-mail address ? Oh my goodness, I cant beleive that I acutally won. I am so excited to receive one of Jeanne's work of art. Thank you soooooo much for such a wonderful giveaway and for continuing to inspire me and all the other women that read your blog and see your products. You are a true blessing. Thanks again. Aww.. I wanted to win! ;) Congratulations to the winners!